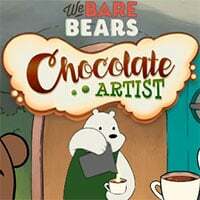 Serve up some delicious cafe drinks in Chocolate Artist Game with the We Bare Bears. Order up! The Bears have turned their cave into a hot chocolate café. Help the bearistas serve up drinks by drawing the symbols over customer’s heads. See if you can get a huge combo! Chocolate Artist We Bare Bears Game is one of our Time Management Games at Round Games. To play even more free games, view our most played and all games pages. If you want to play more games like this game: Then you can simply check out the games inside the game tags that are the most relevant to your interests or check the Time Management Games category or check the related games section at the end of the game page. Also make sure to check out Bear Boom Game, you may enjoy playing it.